So many surprise reveals and announcements! 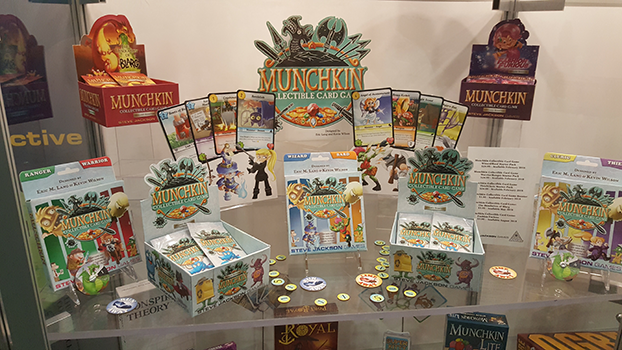 We had big news coming out of Indy, including the first look at Munchkin Magical Mess (coming in January 2018), a date for Munchkin Collectible Card Game (February 2018), and demos of Super Kitty Bug Slap (December 2017). If you tuned in on Facebook, you may have caught a surprise playtest of Conspiracy Theory. 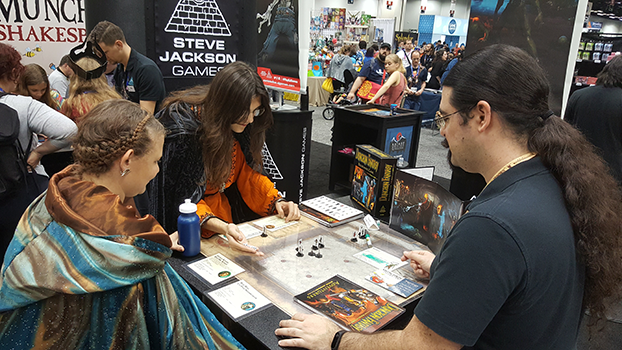 Some lucky SJ Games fans had the opportunity to playtest with Steve himself! We also had the first trailer for the Ogre video game by Auroch Digital. The Steam page also launched, and you can Wishlist the game now to be alerted on release. 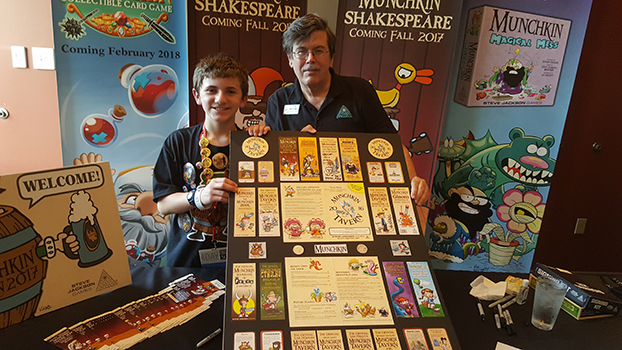 Munchkin Tavern was a blast like always, with even more fans than ever! We thought we had enough swag, but that turned out not to be the case - we sold out of almost everything by Friday night. Sorry to those of you who missed out; we'll try to estimate better next year! But our nightly signings were packed, with tons of Munchkin fans walking away with signatures from John Kovalic, Andrew Hackard, and Steve Jackson. Thanks to everyone, and special thanks to some of our very creative fans. 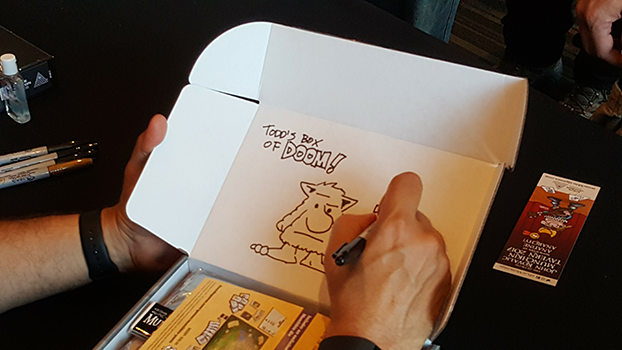 Some of the items folks brought to sign were inventive and unique, like an Etch-A-Sketch with our Munchkin Tavern logo drawn on it while waiting in line! (We're still boggled.) The Tavern also hosted our Dungeon Fantasy RPG Kickstarter-backer game! Two games of adventure took place with writer Sean Punch at the helm, and players got more than they bargained for; their Kickstarter rewards were shipped early to the show! We had limited numbers of Muertoons and Port Royal, and both were big sellers. Batman: The Animated Series Dice Game went quickly as well! We've heard that this was a great show for sales industry-wide; it sure was for us. Hopefully, a lot of folks came home with one of our games! 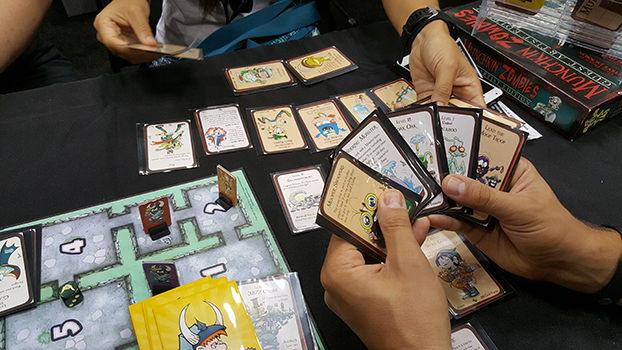 Special thanks to Adventure Retail for their exact-change antics, and for all the freebies they gave to attendees, like free Munchkin Deluxe and Ogre canvas bags! Andreas, Sam, and our MIBs wrangled our Organized Play area like champs! Tons of how-to-plays and tournaments were fired off, secret playtests happened, with few-to-no snags. And to that end, our entire staff did incredible work. From Guy organizing the logistics of the convention and booth, to any of our team demoing games, covering breaks, or making countless meetings, the convention couldn't function without a combined effort. Let's not forget the folks we left back home, either! Warehouse 23 recruited everyone in arm's reach to pack up Munchkin Special Delivery boxes, which shipped while we were at Gen Con. You rock! This was easily the busiest Gen Con I've attended, from both an attendance and personal level. But it was also the smoothest, thanks to a true team effort. 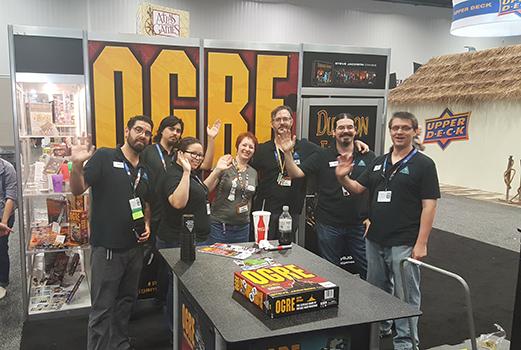 Thanks to everyone who came by, said "Hi", and played a game with us! Thanks to Gen Con staff for the behind-the-scenes work to make the gears turn, and for featuring SJ Games in the historical display. Gen Con has come a long way since Horticulture Hall. Here's to many more years!